Yoshitaka, who was about to leave his marriage and his wife, is poisoned by arsenic-laced coffee and dies. His wife, Ayane, is the logical suspect—except that she was hundreds of miles away when he was murdered. The lead detective, Tokyo Police Detective Kusanagi, is immediately smitten with her and refuses to believe that she could have had anything to do with the crime. His assistant, Kaoru Utsumi, however, is convinced Ayane is guilty. While Utsumi’s instincts tell her one thing, the facts of the case are another matter. So she does what her boss has done for years when stymied—she calls upon Professor Manabu Yukawa. I read The Devotion of Suspect X by Keigo Higashino back in 2011 and loved it. I remember just being stunned by the ending, so I had high expectations for Salvation of a Saint. It was a good mystery, but perhaps not quite as clever as the other. Although it’s the second in the series, it stands on its own perfectly well. We are given everything we need to know and each is pretty self-contained. 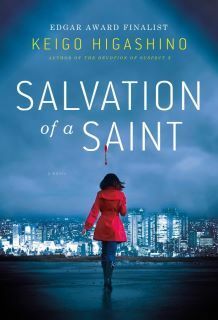 Salvation of a Saint is not so much a whodunit as a how did she do it. We know in the first chapter who the killer is, even though the police don’t. The question for us is how did she do it from hundreds of miles away. So, while we see the police going through the procedure of finding suspects, searching for clues, we’re pretty sure we know who the evidence will point to in the end. I truly enjoyed this audiobook, once I got used to the names. At first, I have to admit, all the Japanese names are a little confusing. David Pittu does an excellent job reading, giving each character his/her own voice and inflections with just a touch of a foreign accent that adds to the flavor of the book. When the solution as to how the poison got in the coffee isn’t clear, Utsumi calls in physics professor Manabu Yukawa who has helped on several cases in the past. He’s just a brilliant man, curious about the hows behind cases, not so much concerned about justice. I can’t say this is a character-driven mystery; it definitely falls more into the puzzle category, although one character does drive the story- Ayane. I don’t want to tell you too much, but she manages to be both caring and cold-blooded, calculating and hopeful. And the solution, while perhaps not earth-shattering is still pretty surprising, in that someone could actually pull it of. I’m really enjoying this series. I guess there’s a third that hasn’t been translated yet. I’m looking forward to it. I like mysteries like that. It sounds like the audio is great!